Sir,—You point out in your leader Time Lord of the Air Waves (April 9) that the BBC is beginning to pitch the pieces at a somewhat older audience, and that the Doctor is " only partly of our passions." 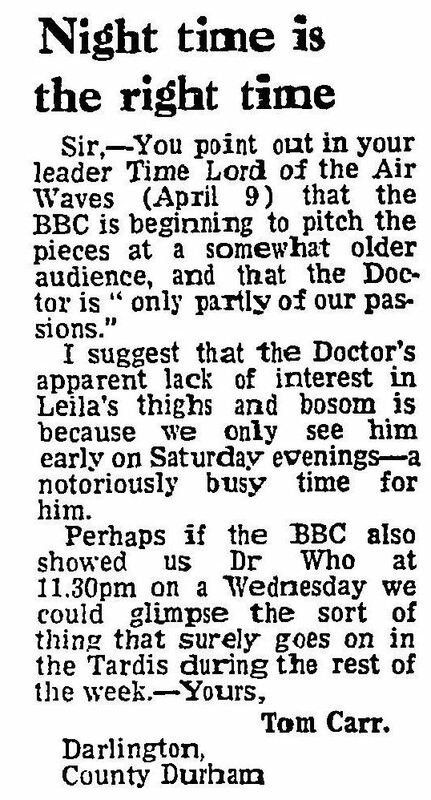 I suggest that the Doctor's apparent lack of interest in Leila's thighs and bosom is because we only see him early on Saturday evenings—a notoriously busy time for him. APA 6th ed. : (1977-04-14). Night time is the right time. The Guardian p. 12. MLA 7th ed. : "Night time is the right time." The Guardian [add city] 1977-04-14, 12. Print. Turabian: "Night time is the right time." The Guardian, 1977-04-14, section, 12 edition. This page was last modified on 21 December 2014, at 18:50.